Hi! My name is Gryph (short for Gryphon). 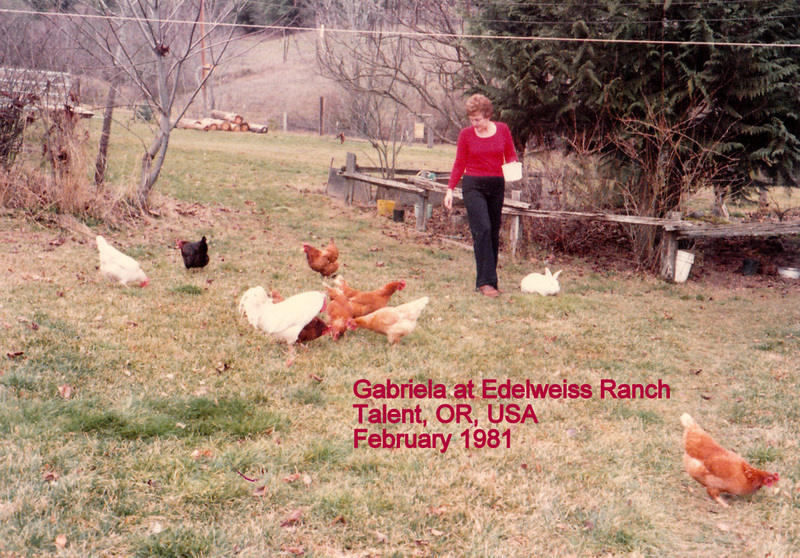 There's a long story behind Edelweiss Ranch & Rabbitry. 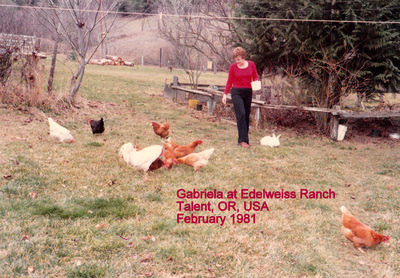 The original Edelweiss Ranch was founded in Talent, Oregon by my grandparents, Peter and Gabrielle. The sign that hangs at the entrance to my driveway is the original sign made by my parents for my grandparents more than 35 years ago. You can read more about the history of the name below. 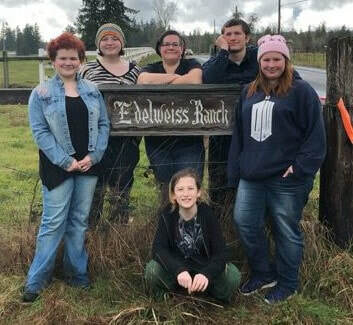 Edelweiss Ranch & Rabbitry is located in Graham, Washington in the beautiful pacific northwest and is a family-run farm primarily raising rabbits for meat, fur and show, alpacas for fiber, and sheep for milk, fiber and meat. I also have chickens for eggs. 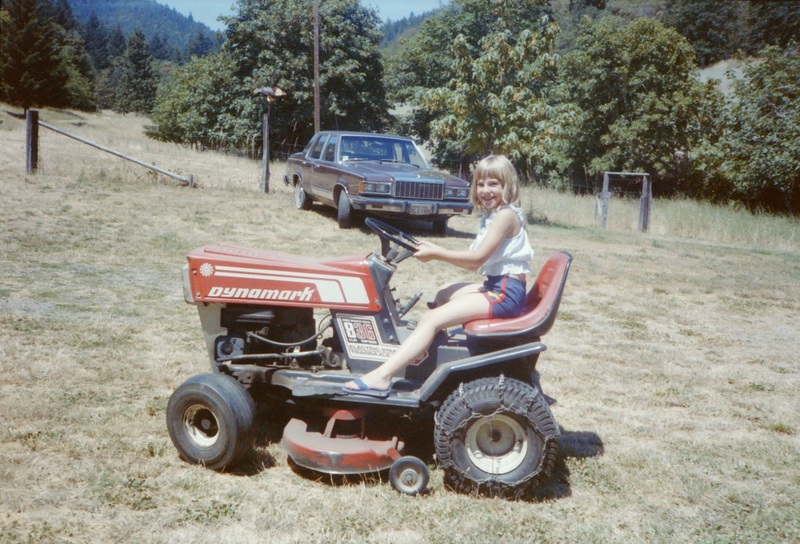 Edelweiss Ranch & Rabbitry is not only home to my family, it is also a long-term family project to become more self-sufficient. My goal is to become less reliant on our society's commercialism. 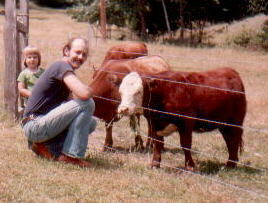 Through gardening, re-purposing, and raising animals for meat, milk, eggs and fiber, I hope to cut back on our carbon footprint. I strive to barter as much as possible: services, livestock, eggs and yields from the garden... all could be bartered. 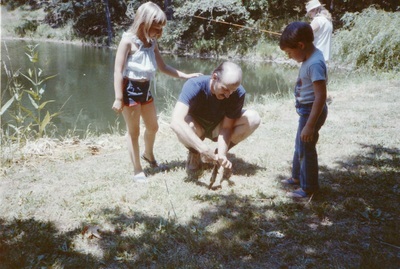 ​When I started my farm I had all my plans laid out on paper after years of careful research. The irony is, almost none of my original plans worked out. Most of the things I swore I'd never do (sheep and rabbits for example) are the things that ended up working out best for me. After several years of trial and error, I'm very happy with the direction that the farm is going. One of my big passions is hosting and promoting swaps, bartering, and community. To that end, I started hosting Farm Barter Faires here in Pierce County. 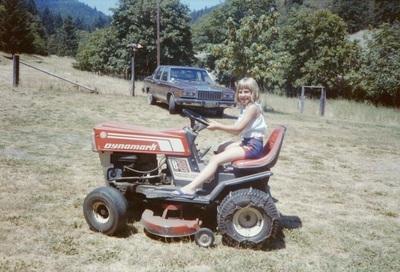 I'm working hard to help promote other farm-type, home-made, and plant swaps in the pacific northwest. I run the PNW Farm Barter Faire Networking group on Facebook. I also mentor and educate about raising rabbits. I was fortunate to have some very good mentors that taught me a lot, and I committed to passing that knowledge along to others. I host classes and workshops here at the Ranch, in addition to one-on-one mentoring. Here is more information about Edelweiss Ranch & Rabbitry. 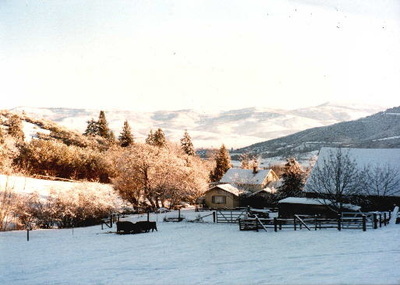 The history of Edelweiss Ranch is rich and stretches back several generations. 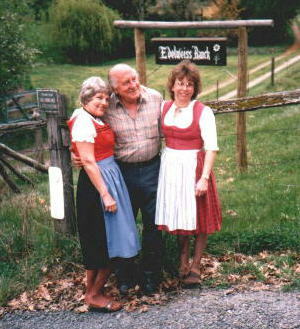 The original Edelweiss Ranch was in Talent, Oregon and was owned and run by Peter and Gabrielle Joeschke, my Omi (oma) and Opi (opa). The sign that hangs out front now was commissioned by my parents for my grandparents, and hung at the farm in Oregon for many, many years. It was made in downtown Seattle, at a now-closed sign shop that was on the waterfront. My grandparents were very proud of their farm, and it was their little piece of paradise to retire on. 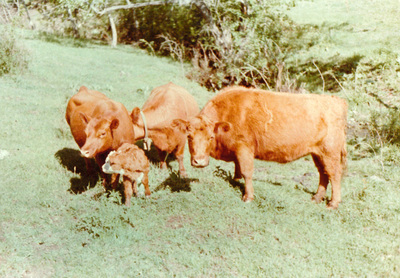 theI spent every summer on their farm when I was growing up. I have many fond memories spending summers at Edelweiss Ranch, roaming the acreage and fishing in the pond, eating veggies straight out of the garden and fruit out of the orchard, feeding the chickens and collecting the eggs, offering grass to the Red Angus cows, and staining my fingers with the juice from the fresh blackberries, gooseberries, currants, raspberries and strawberries that my Omi nurtured. 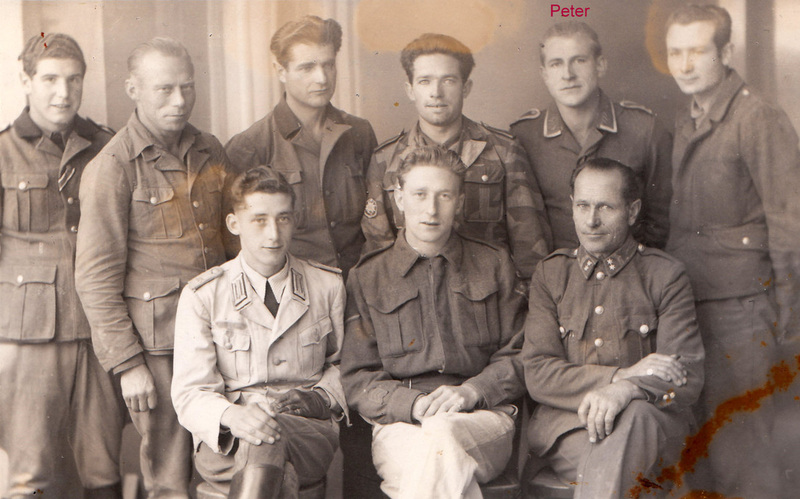 As told to me by my grandparents: Peter was a Prussian pilot, conscripted to fight for the Germans in WWII when Prussia was overtaken. Gabrielle's parents owned an inn in Austria and Peter and Gabrielle met and fell in love during the war when he stayed at her parents' inn. He told a painfully young Gabrielle that if he survived the war he would return for her. 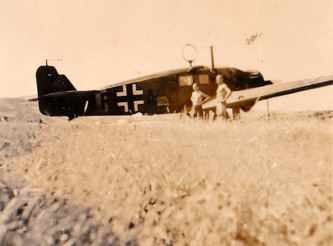 Although he was shot down early on and taken as a prisoner of war by Great Britain, he did indeed survive and he returned for his Gabrielle. 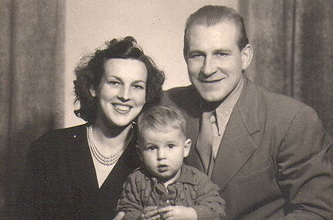 They married on April 7, 1948 and had their first child, a son named Klaus (my father), in 1950. 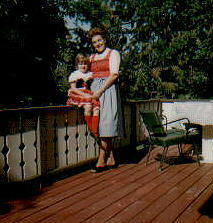 They immigrated to the US in 1952 when Klaus was just 2 years old, and then had a daughter named Evelyn. 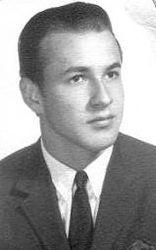 After a long journey that spanned the US, their two children grew to adulthood and Peter and Gabrielle settled in southern Oregon. 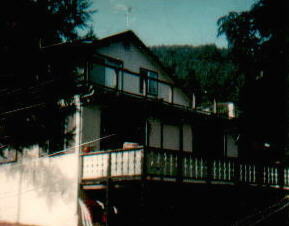 They ran the The White Motel in Ashland until 1974 when they sold the Motel and founded the original Edelweiss Ranch in Talent. 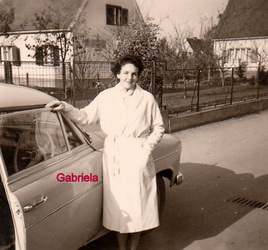 The Edelweiss flower, you see, was Gabrielle's favorite flower. Stories say that the Edelweiss flower has been valued as a powerful talisman to ward off evil. It was also considered the ultimate love charm, as love-struck young men would attempt to collect Edelweiss from dangerous, barely-accessible crags and ledges in the high alpine areas of Europe. Many young men died from falls or succumbed to exposure during these brave attempts. For those that survived, collecting and presenting a bouquet of Edelweiss proved that the suitor was brave, able-bodied and serious in his intentions. I often wonder if my Opi presented her Omi with such a bouquet. He certainly crossed a war-torn Europe to return to her. Edelweiss (Leontopodium alpinum) is a small alpine plant with a white flower that is native to mountainous European locations such as the Pyrenees, the Alps and the Carpathians. Edelweiss is part of the daisy family. 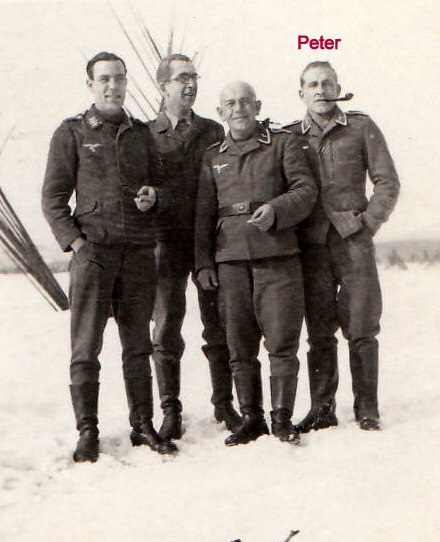 The name 'Edelweiss' comes from two German words (Edel meaning 'nobility' and weiss meaning 'white'). In the language of flowers the Edelweiss flower represents daring or noble courage, most likely related to the above story about beaus collecting these flowers from mountain crags. Many people recognize the name Edelweiss from the song written by Richard Rogers and Oscar Hammerstein II for the musical 'The Sound of Music' which premiered on Broadway in 1959. 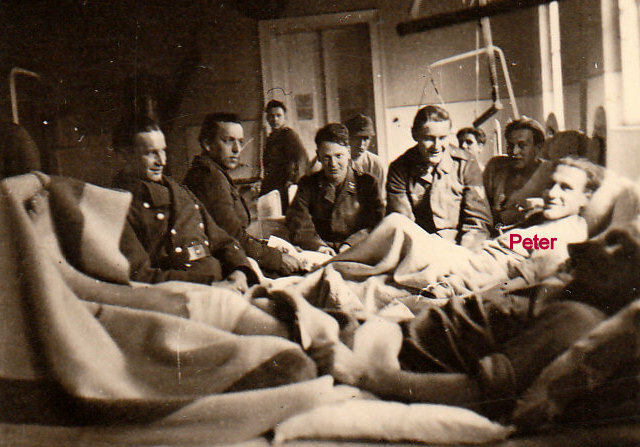 The song symbolizes the spirit of Austrian patriotism in the face of the 1939 Nazi invasion. Because my grandparents were directly affected by that very invasion, the name Edelweiss Ranch takes on even more significant meaning. Peter and Gabriele raised red Angus cattle and chickens on their farm, as well as tending their many berry plants, fruit trees, and extensive garden. 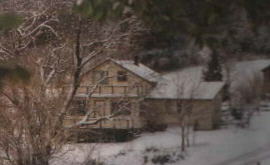 Their two adult children and their families often made the trek to southern Oregon over Christmas to spend the holidays with them. During summer, Peter and Gabriele's grandchildren loved to spend time with our Omi and Opi learning to fish, garden, and lovingly create hand-crafted things. Gabriele was especially fond of deer, and she was very proud that she was able to attract many tame deer to the Ranch to be hand-fed. Their son and daughter-in-law- my parents- had a special sign made for them at a place that no longer exists along the Seattle waterfront and gifted it to Peter and Gabriele for Christmas. That same sign now hangs at the current Edelweiss Ranch in Graham, Washington. 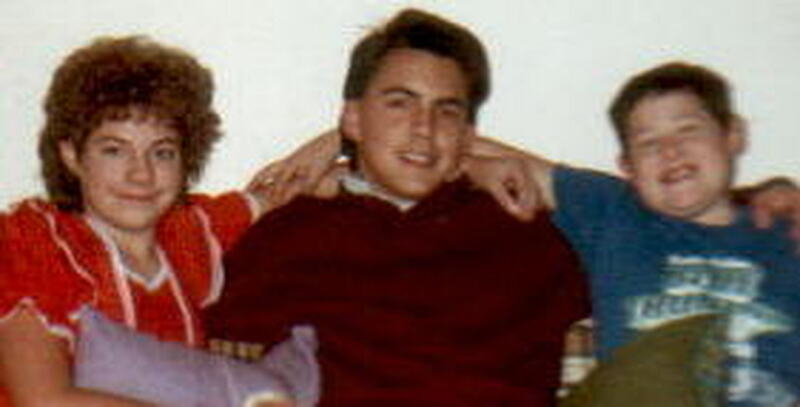 Peter and Gabriele's daughter Evelyn passed away in February of 1988 and Gabriele lost her battle to cancer in November of 1988. 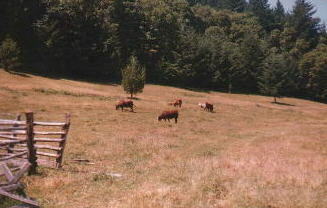 Without his partner by his side, Peter sold the Ranch and moved to Medford. He lost his own battle to cancer in 2002. 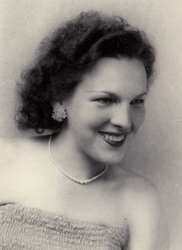 Their son Klaus passed away in 2012. In honor of their memories, I founded the current Edelweiss Ranch where I hope to continue the family tradition of bravery and courage. 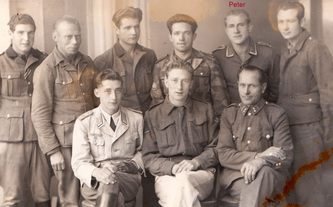 Peter and Gabriele had three grandchildren, in the right photo (left to right) Gryph, Eric and Klaus. 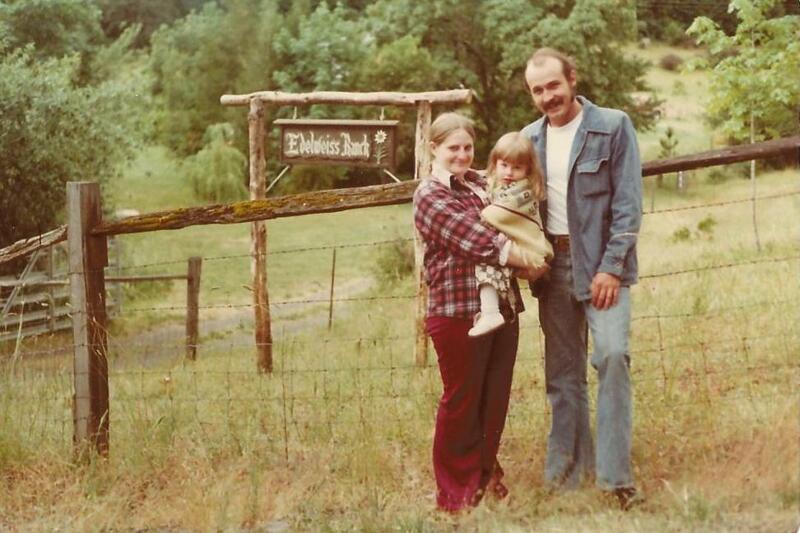 They are standing in the photo below at the new Edelweiss Ranch along with Klaus' spouse. 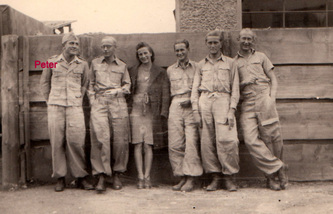 Left to right: Heather, Gryph, Eric, and Klaus.